This is one of those quick recipes that tastes amazing. I always buy whole chickens, not breasts, as it saves you money if you use the whole carcass. 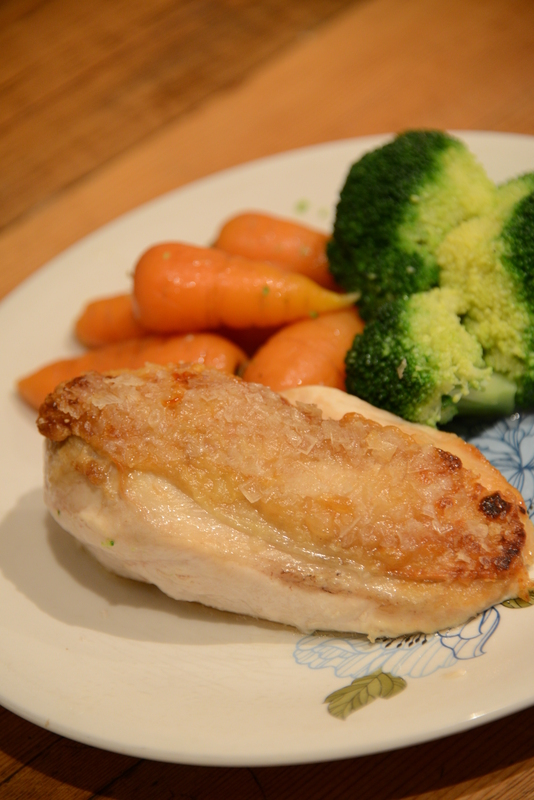 1 whole chicken (small family roast size – usually around £4-£5 in supermarket). Take the breasts off your chicken, and include the wings in this cut (this joint is known as a Supreme). The rest of the chicken should be kept – the carcass will make a great soup, and the legs and thighs will make perfect chicken hot pot (recipe to follow in the next day or so). Press Maldon sea salt crystals into the skin side of the chicken (DO NOT GET ANY ON THE FLESH!). Get a frying pan hot, and pour in a little rapeseed oil (see Drury & Alldis for best quality). Place the breasts, skin-side down in the pan and cook until this skin is golden brown. Remove the breasts from the pan and place in a roasting tray in a preheated oven at 180c for around 15 minutes. While your chicken breasts are in the oven, put a pan of water on to boil. Once boiling, add the carrots; after 10 minutes add the broccoli; and 3 minutes after that, remove from the heat. Pour off all the water, add a good knob of butter, and allow to rest. Check the chicken is cooked through. If it is still a little pink in the middle, put back in the oven for 5 minutes more. Serve the chicken and vegetables with the juices from the roasting tray drizzled over. I’ve been nominated for the UK blog awards. If you like my recipes please vote for me here.